atch the movie “My Big Fat Greek Wedding,” and you’ll get an idea of how Associated Student Body secretary Christine Hayden grew up. 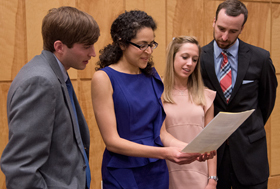 Hayden, by the way, is the first School of Pharmacy student to hold an office in the University of Mississippi Medical Center’s ASB. Her grandmother was born to Greek immigrants in Pennsylvania, and her grandfather moved from the island of Lemnos, Greece, in his early 30s. 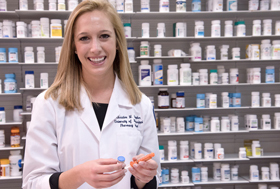 Hayden’s grandmother passed up the opportunity from her employer to attend pharmacy school. She was dedicated to being a wife and a mother rather than pursuing a career. Hayden and her 96-year-old “Yia Yia” (pronounced yay-yah) even share a Dec. 6 birthday. In the European tradition, her parents and grandparents lived under one roof. Although Hayden’s grandfather passed away 10 years ago, she still has fond memories of “Papou” from her childhood. “He and my grandmother watched me while my parents worked, so I was with them all day long,” Hayden said. “When he lived with us, he would only speak Greek to me. I can understand more than I can speak, and I can understand more than my brother. But I haven’t kept up with the language much since my grandfather passed away. Hayden records minutes at the first ASB meeting of 2016. An example is the time her grandfather invited the neighborhood over to experience an authentic Greek Orthodox Easter. Hayden’s dad, originally from California – not Greece, experienced almost as much trouble when he tried to date Hayden’s mother, Marianthi Kokolis, as the movie’s Ian Miller (played by John Corbett) did, when he tried to date Toula Portokalos (played by Nia Vardalos). “I wish I could have been a fly on the wall when my dad and my grandfather met,” Hayden said. “He would put my dad through the ringer. The only requirement, so far, for Hayden’s boyfriend, Arthur Davis, a third-year medical student at UMMC, has been to watch the movie. Hayden moved around a good bit when she was growing up – from Philadelphia, Pennsylvania, to Jacksonville, Florida, then Knoxville, Tennessee. The family settled in Birmingham, Alabama, 14 years ago, a city that, according to Hayden, has a very large Greek community. Pharmacy school brought Hayden to Mississippi and eventually to Jackson. Hayden said that participants interview for the program during senior year of high school, meaning a student must have an early desire for a career as a pharmacist and stick with it. “I really appreciate my parents for making me shadow all sorts of health care professionals before I decided what my major would be,” Hayden said. “I knew right away, through a process of elimination, that I didn't want to do nursing, and I didn’t want to go to medical school. For now, Hayden is focused on applying for residency programs, and competition is fierce. 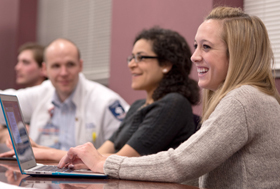 Hayden became involved in student government while attending the School of Pharmacy in Oxford. She served one year as student body president-elect, then a year as student body president. Although the students may enjoy the many ASB parties held throughout the year the most, Hayden, ASB president Sarah Ali and vice president Jeff Peeples organize many other activities. Ali said this year’s primary focus is student wellness. The group has a new wellness chair who organizes events to promote health and wellness activities for students. The group also focuses on inclusiveness, interprofessional dialogue and giving all the schools more confidence to be involved across campus. For Hayden, serving as ASB secretary has been an exciting experience. One last question, the one we’ve all been waiting for: Where do you find the best Greek food in Jackson?